Helps prevent numerous diseases (common cold, hypertension, arthritis, cancer and cardiovascular disease …). ascorbyl palmitate, a fat-soluble form of vitamin C.
These three forms of vitamin C act synergistically within the body. it protects cells from the ageing process, acting in synergy with vitamin E, beta-carotene, le selenium, and zinc. Where can we obtain vitamin C? The majority of mammals are able to produce vitamin C themselves, but humans lost this ability a long time ago, which is why this vitamin is classified as essential – we need to ingest it from the diet. While everyday foods such as fruit and vegetables are rich in vitamin C, they may not provide sufficient levels to cover our daily requirements. Vitamin C is fragile and is easily destroyed by light and heat. Vitamin C supplements have therefore been developed as a way of obtaining an optimal intake. Often taken to safeguard against vitamin C deficiency, vitamin C supplements are also indicated for preventing and treating a number of ailments. 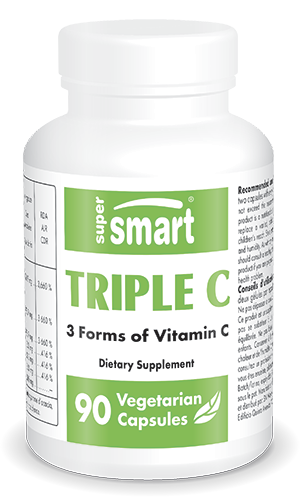 Of the vitamin C supplements we offer, Triple C is therefore the most popular with our customers. What are the benefits of supplementing with vitamin C? Ensuring an optimal intake of vitamin C is essential in order to prevent deficiency or compensate for any shortfalls. Supplementation can also offer preventive and therapeutic benefits. Hence its widespread use for combatting oxidative stress, improving iron absorption, boosting the immune system, fighting temporary tiredness, preventing colds and ‘flu, lowering blood pressure and preventing hypertension, reducing the risk of heart disease, and preventing both cognitive function decline and cataracts. Why choose Triple C? Popular with our customers for its efficacy and value for money, Triple C is produced from top quality ingredients. It has been specifically formulated to combine three forms of vitamin C in a single capsule, providing an optimal dose of 200mg of ascorbic acid, 300mg of calcium ascorbate and 15mg of ascorbyl palmitate. Its efficacy is further enhanced by the addition of 50mg of flavonoids. Available to purchase from our website, the recommended dose for this vitamin C supplement is one to two capsules a day. Ordered in just a few clicks, and delivered within a few days, you could soon be benefiting from this comprehensive formulation. Take one or two capsules per meal, according to your needs.